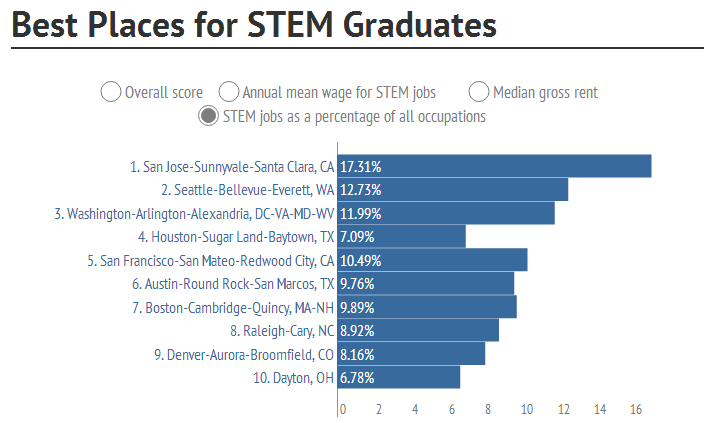 The San Jose Blog: Saturday Stats: San Jose is the #1 Place for STEM Graduates! 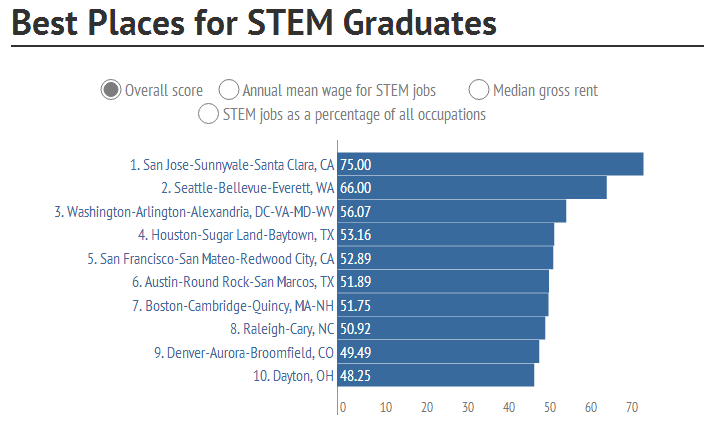 Saturday Stats: San Jose is the #1 Place for STEM Graduates! Today we have another one of those Saturday Stats to really be proud of. According to NerdWallet--which is based in SF by the way--San Jose is the #1 place in the United States for STEM jobs (Science, Technology, Engineering, or Math). It wasn't even close. They looked at three main criteria: the mean wage for STEM occupations (25%), the size of the STEM industry (50%), and the median gross rent (25%). 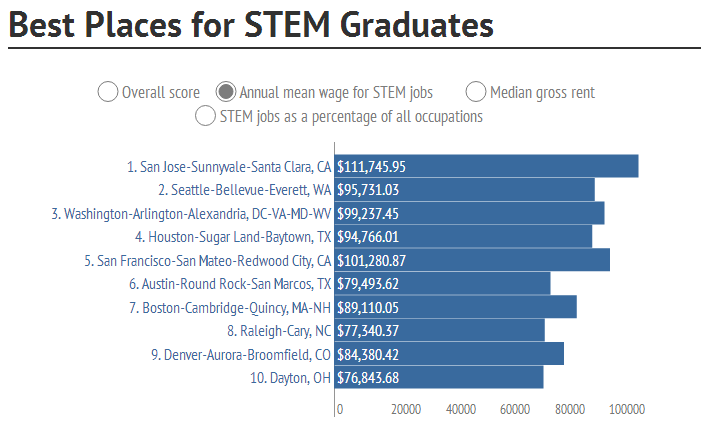 Despite coming in the highest with the median gross rent (a big negative), San Jose's $111,745 mean wage and the fact that 17% of all jobs in San Jose are related to STEM gave us a towering lead in the overall score. The data is below, and is well worth taking a look. Only three other areas in California made the cut. 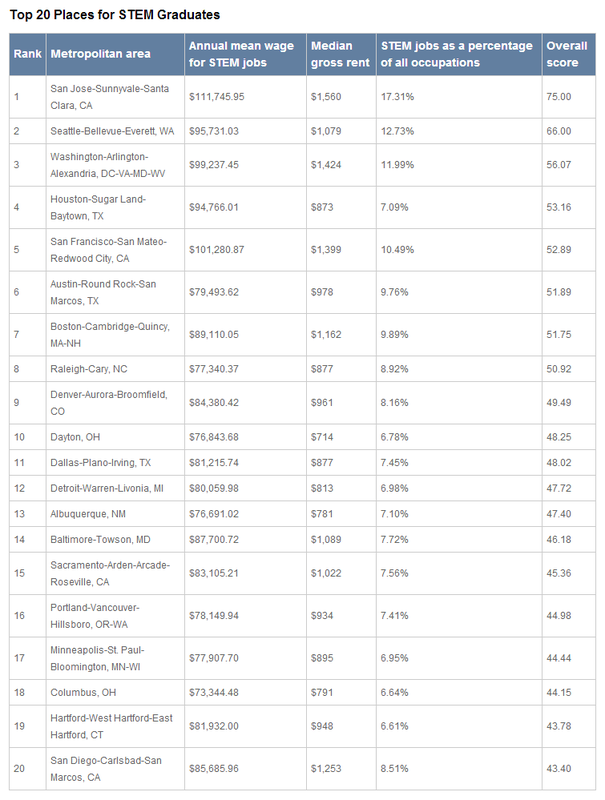 San Francisco was #5, Sacramento was #15, and San Diego was #20. Source: NerdWallet, Thanks to Christopher Rein for sending this in. Thus, when we're talking about STEM salaries or the general desirability of STEM jobs, what we're really talking about is "TE": technology and engineering, particularly coders. That's where the demand is, and that's what's buoying the salary numbers here. America's universities are dumping 1000's of science PhD's on the market every year, but they're not who's getting hired in silicon valley.